Oh how the weather has shifted indeed! Our once vibrant green fescue lawns growing 2″ per week have wilted and dried up. Our once cool nights and mild days have turned into near scorchers and zero rain to boot! But how do I irrigate? 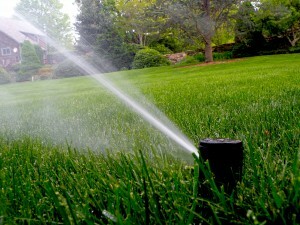 I get asked often “how long should I run my irrigation system?” or “how long should I water my yard?” And the answer I have to give is, “it depends.” You see, water pressure can vary from neighborhood to neighborhood. Water pressure, nozzle selection, and even the types of heads can all influence how irrigation systems perform. The real magic in an irrigation system is measuring exactly how much output you’re getting. How do you measure irrigation output? It’s easy I tell you! I recommend using empty tuna cans, pie pans, or even cat food cans and placing them somewhere in the lawn. Turn on the irrigation zone that covers the area with the tuna can. Time exactly how long it takes to fill up that tuna can. Voila! That time it takes to fill up the tuna can is how long you should run your irrigation system. Effectively what we’re looking for is 1″ of water per week. Infrenquent, deep waterings promote deeper root development. The deeper the roots run, the better the defense against environmental stressers, thus resulting in more aesthetic surface growth. What about when it gets scorching hot outside? Come July and August, when the temps are near 100, and there is no rain in the forecast, it may then be necessary to increase water to 2″ per week. How do you do that? Run your 1″ water cycle on 2 different days. So if you typically water on Monday, maybe add Thursday. Proper watering is an integral part in plant survival. Do your part to help the plants survive!